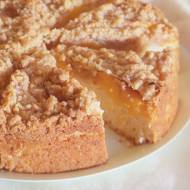 Any peach variety is delicious in this coffee cake, from fruits that are bright yellow-orange with a rosy blush to those that are the palest white. Even ripe peaches, however, may be difficult to peel. To peel them easily, bring a saucepan three-fourths full of water to a boil. Using a small, sharp knife, cut a shallow X on the blossom end of each peach. Immerse the peaches in the boiling water for 20 to 30 seconds. Lift out with a slotted spoon and let cool on a work surface. Using your fingers or the knife, slip off the skins. Preheat an oven to 350°F (180°C). Grease and flour a 9-inch round springform pan or square baking pan or baking dish (see Note). To make the streusel, in a bowl, stir together the flour, brown and granulated sugars and cinnamon. Add the butter and, using a pastry cutter or your fingers, cut or rub in the butter until coarse crumbs form. Set aside. Spoon the batter into the prepared pan and spread evenly. If using a springform pan, arrange the peach slices in concentric circles from the pan sides to the center. If using a square pan, arrange the slices in rows. Gently press the slices into the batter. Sprinkle evenly with the streusel. Bake until the topping is golden brown and a toothpick inserted into the center of the cake comes out clean, 40 to 45 minutes. Transfer the pan to a wire rack and let cool for 20 minutes. Remove the sides of the springform pan, if using. Serve the cake warm or at room temperature, cut into wedges or squares. Note: If using a glass baking dish, reduce the oven temperature to 325°F. Delicious! Works with canned peaches, too.